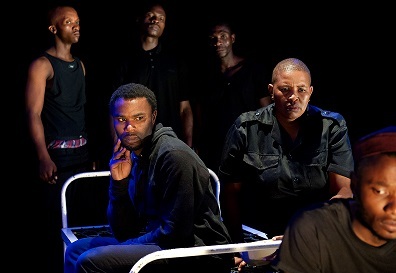 Ulwembu, which is enjoying a brief run in the Playhouse Loft Theatre, is a brutal, hard-hitting, bleak and shocking production. It is, nonetheless, an extremely important piece of theatre. It tells the story of the devastation and misery that is being wrought on our communities by the drug that goes by the rather amusing name of Whoonga. Ulwembu is the IsiZulu word for spider web and this insidious drug is exactly like that. Users are entrapped and there is no escape and soon the entire community can be affected by a vicious cycle of deceit, theft, violence and neglect. But this production is not a stereotyped “say no to drugs” play.It is a deeply-researched theatre project which is authentic, insightful, razor-sharp and frighteningly real. In fact, I would go as far as to say that this is educational theatre at its zenith. Over a period of two years a team of story-tellers, playwrights, theatre-practitioners, academics, and researchers set about investigating the Whoonga (low grade heroin) crises in Durban. They interviewed community leaders, police, users, social workers and parents. The result is the powerful production, Ulwembu. The creative team for Ulwembu consists of award-winning playwright and director Neil Coppen, top local actress Mpume Mtombeni, the Kwa-Mashu based community-theatre group, The Big Brotherhood, and educational sociologist Dylan McGarry. Mpume Mtombeni, playing a police lieutenant whose son becomes a Whoonga addict ,is simply superb. Her memorable performance is one of deep emotion and strength. The actors from The Big Brotherhood included Vumani Khumalo, Phumlani Ngubane, Ngcebo Cele, Sandile Nxumalo and Zenzo Msomi. All of them cover themselves in glory with their passionate performances. Special mention must be made of the brilliant lighting design by Tina Le Roux. It is an integral part of the production and instrumental in creating the rather bleak and chilling ambiance. Direction is by Neil Coppen and design by Dylan McGarry. Is Ulwembu entertaining? Strangely enough, yes. After the diet of comedy and music tributes which are normally dished up to Durban audiences it is a rare pleasure to see a team of such accomplished theatre practitioners producing something cerebral, engrossing and meaningful. The Department of Education should make this production compulsory viewing for every pupil in the land. Ulwembu has been made possible through the generous support of the Urban Futures Centre, Twist Theatre Development Project (Twist Durban), Think Theatre and the generous constant support of the Denis Hurley Centre.